With that sorted out, let’s look at what macroeconomists are writing. First, there’s Simon Wren-Lewis, who explains that “not much” has changed in the teaching macroeconomics since the crash of 2007-08. So, according to Wren-Lewis, the problem lies not with basic macroeconomic theory but with the fact that the policy advice of macroeconomists has not been followed. Much the same view is reiterated by Paul Krugman and Jonathan Portes, who claim that the theory espoused in the macroeconomic section of Econ 101 “has done just fine.” What I want to know is, which part of that theory doesn’t need to be reexamined in light of the events of the past few years? Let me provide a few examples. At the level of teaching, where is the history of the theories and debates that have taken place in macroeconomics since at least the publication of John Maynard Keynes’s General Theory? And what about the theories other than the neoclassical and Keynesian versions of IS/LM—where do they fit into the curriculum? As far as the theory is concerned, what role does uncertainty play in their models? And how do crises occur endogenously, rather than as the result of some exogenous disturbance in either the real or financial side? And what about the role of inequality in determining the level and rates of growth of prices, output, and employment (not to mention the external sector)? And, finally, what’s the explanation of how alternative economic policies are adopted and implemented, other than as irrational mistakes? 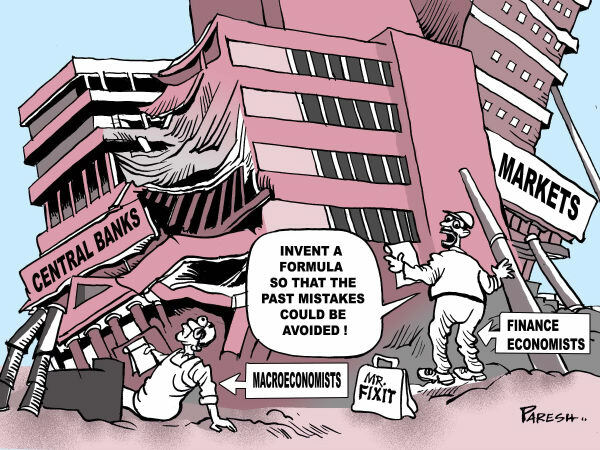 Macroeconomics, as taught in universities and utilized in economic analysis, was not in good shape prior to the crisis. And it’s certainly in no better shape now, after the financial crash and in the midst of the most severe economic downturn since the Great Depression. What, then, about microeconomics? Diane Coyle [pdf] seems to think that, while macroeconomics may be in shambles, all is well in the area of microeconomics, based on the concepts of opportunity cost and cost-benefit analysis. Unfortunately, macroeconomics is not only what people (mistakenly) think all economists do, it is indeed an important part of what policy economists actually do. Most macroeconomists work either for the government or in financial markets. Even though the discipline does not have a consensus view of how the economy as a whole should be analysed, there is no escape from the need in either case to work on the basis of some reasoned assumptions about the near future (or forecasts, as they are called). The comparison with weather forecasting is often made – another imprecise science, marked by bitter arguments about the right analytical framework for understanding the climate as a whole, but essential for the planning of everyday life. Although the uncertainty attached to weather forecasts is widely understood, economic forecasts are – wrongly – regarded by the general public as more certain, not least because of the way some economists at any rate have talked about them. Macroeconomic forecasters need to be more explicit about uncertainty. There are other lessons to be taken from the groupthink that prevented so many economists from seeing clearly the risks in obvious precursors of trouble such as persistent current account imbalances and the build-up of debt. These would include paying more attention to economic history, to institutional realities (such as the changing character of the financial system in the 1990s and 2000s), and perhaps a greater pluralism or inter-disciplinarity in the practice of macroeconomics. . . So there are some valid principles that economists know and agree among themselves to be true, but to many non-economists these may fly in the face of ‘common sense’. There is also a steadily growing body of empirical policy research, which might be rather nuanced or context-dependent, but equally is scientifically well-founded and commands professional consent. Applied microeconomists have a pragmatic common language for assembling evidence and discussing policy. Disagreements concern the details of empirical methods or the interpretation of evidence. This is normal science at work. What Coyle overlooks is that, even in applied microeconomics—however augmented by psychology and institutional detail—the presumption is that costs and benefits can be calculated and markets designed to achieve the desired results. But costs and benefits to which classes? Where is the limit on possible costs and benefits arbitrarily drawn? And, finally, to use Coyle’s language, how is it possible to separate the resource-allocation and value-performative effects of markets? No, neither macroeconomics nor microeconomics is in good shape. They weren’t before the crisis began and they’re not now, in the midst of the Second Great Depression. Both areas need to be fundamentally rethought. Economics in the crisis remains in crisis. Can you list a few books and articles that come to grips with this shambles and try to redo macro or point the way to such a rethink?